OK so not strictly something to do in London, but simply breathtaking nonetheless. As a planetarium presenter at the Royal Observatory Greenwich I show thousands of people this picture every year and it never ceases to captivate both me and them. 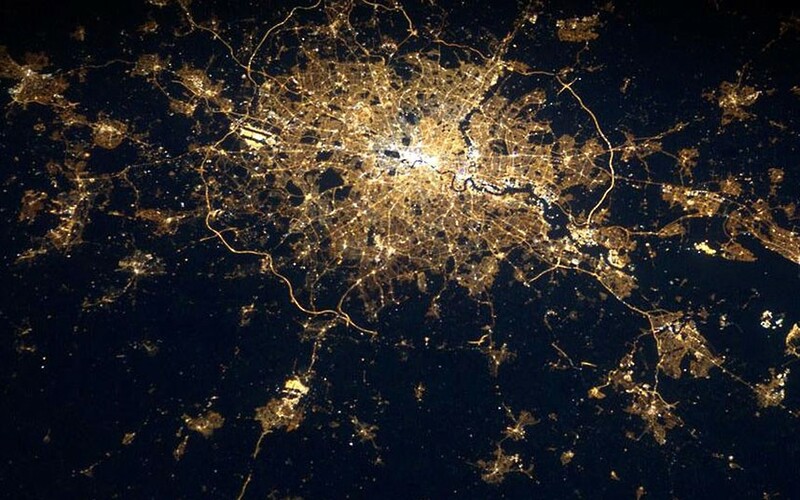 Taken by European Space Agency astronaut Andre Kuipers, whilst orbiting the Earth at 17,500 mph on the International Space Station, it shows our capital as an almost living organism. The unmissable M25 motorway provides the skin around the outside with London’s major thoroughfares acting as arteries, transporting vital supplies around to keep the city ticking. You can’t fail to spot Heathrow Airport on the far left, a place to feed the metropolitan animal with new visitors. From the East, the brightness of the lights intensifies as you snake around the ‘Eastenders’ river bend to reach the gleaming heart of London. Whilst as an astronomer the lights reduce my view of the stars, it’s sometimes hard to argue with them when they show off my home so spectacularly to the rest of the universe. London’s most famous fake animals are probably the lions who guard Admiral Nelson in Trafalgar Square. However, further down the northbank of the river, close to Blackfriars Bridge and HMS President, you’ll find some unlikely creatures: camels. 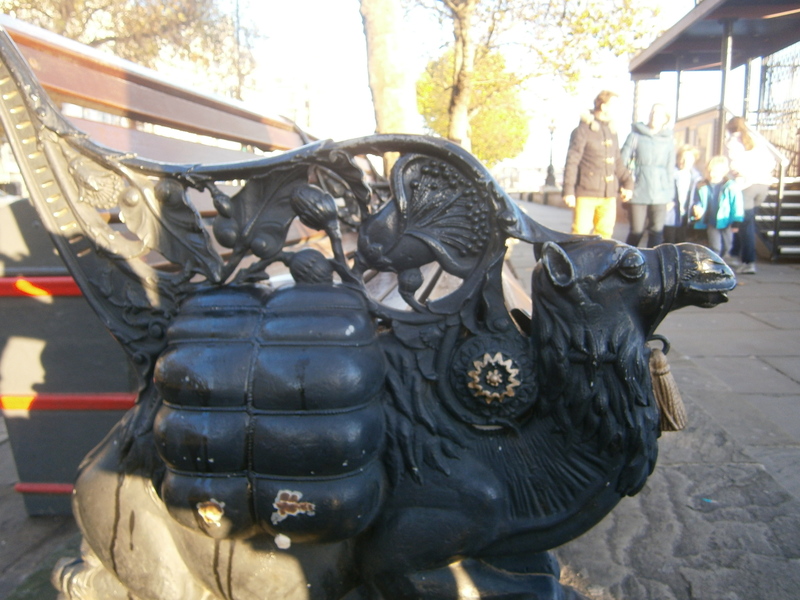 Having walked along the river many times, I’ve always managed to overlook these tassled creatures bookending the waterside benches. Doing a bit of digging I’ve found that they were installed 1878, putting pay to one notion they were installed to match the memorial to the Imperial Camel Corps which sits in nearby Embankment Gardens. The Imperial Camel Corps was a camel-mounted infantry brigade of the First World War and so their memorial wasn’t installed until 1916. It seems the camels of Victoria Embankment may be there to compliment the Egyptian theme of the area, with Cleopatra’s Needle – an 1819 gift to the UK to commemorate Nelson’s victory at the Battle of the Nile – standing nearby. Due to the cost of transporting it to Britain, the needle wasn’t actually brought to London until surgeon Sir Erasmus Wilson stumped up the £10,000 (!) required to get it here. It was finally raised in 1878 – the same year as the installation of the camels. The ungulates are still standing today, peering over the Thames with a great view of the London Eye upstream. Hide by name, hide by nature – at least that’s what our drinks did for nearly half an hour at this Bermondsey Street cocktail bar. Having just moved into the area, Ruth and I were keen to explore “The Street” and took the opportunity to pop round the corner for a cocktail after our Valentine’s meal in. Upon arrival we were shown to a table towards the butterfly wallpapered back area of the bar. After a few minutes of deliberation, I went up to the bar to order our cocktails. I was asked where I was sitting and told that the drinks would be brought over. Almost fifteen drinkless minutes later, we grabbed a waiter and said our drinks hadn’t arrived yet. He went to look into it. Ten minutes later, still no drinks (or waiter). Ruth went to see what was happening and a few minutes later a third waiter returned to our table to inform us our drink order had been lost and we were asked to order again. No apology – just a matter-of-fact sense of ambivalence towards us. When the drinks finally arrived, around half an hour after we’d initially ordered them, they came without any kind of regret or apology for the wait. I’d love to say that it was because it was Valentine’s and they were heaving, but the bar wasn’t overly crowded – they must see more people on a Friday night. The sorry state of the service was a shame because the belated drinks were actually pretty good. I had the Eagle Sling – Eagle Rare single barrel Kentucky Bourbon, Galliano Authentico, orange and lemon zests, stirred and topped with Canada Dry ginger ale. Ruth plumped for the Passionate Englishman – Hendrick’s Gin stirred with passion fruit purée, lemon and sugar. But by that time the shine had been taken off the experience and, rather than try something else from the extensive menu, we went home. On asking for the bill at the bar it came back with someone else’s drinks on, just to compound our sense of their incompetence. We got them removed, settled the bill and left. Nice drinks, shocking service. Perhaps they were having an off night. We were really excited about having such an extensive menu of cocktails – some of which are Hide originals – a five minute walk from our new front door. With it being so close, we’ll probably try it again and report back. But don’t hold your breath.